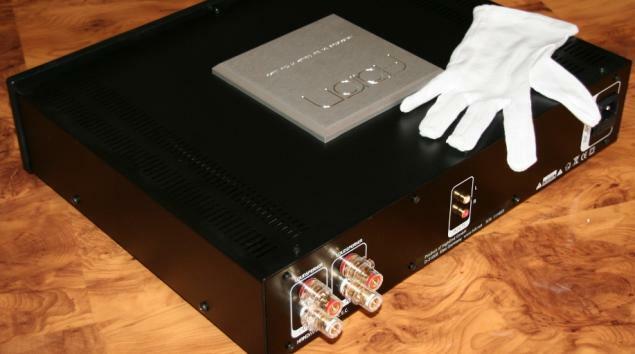 AARON® No.3 Millennium ® The High-End Stereo power amplifier from Germany. A must for serious music lovers. Power, control and precision - these are the virtues of this high-end stereo amplifier. Experience your favorite music with the impressive dynamism and natural feel of a live concert. Whether small ensembles, such as chamber music, jazz, etc., or large orchestras and rock events - with this amplifier you can let yourself get carried off into any adventure in the world of music. What do you want to experience today with the No.3 Millennium? The No.3 Millennium is an amplifier that carries your speakers to sonic excellence. In particular, as the owner of very high quality, sophisticated or powerful speaker systems, you'll be thrilled. So, how many music lovers and audio professionals are already familiar with the sonic qualities of this amplifier? Leading international high-end audio magazines attest to the best possible price-performance ratio of the No.3 Millennium amplifier, and they have honored this amp with a big "Bravo". Of course we're delighted over so much praise and all the nice words, but we do build this amp for you – for music lovers and connoisseurs of near-live music reproduction. The special circuit layout with optimized, very short signal paths in mono-module design and the use of selected components on the power modules, coupled with a generously dimensioned power supply, ensures an impressive music experience. The almost legendary stability of the No.3 Millennium amplifier, even on speakers with critical impedance processes, sometimes to well below 2 ohms, or on systems that are difficult to operate, is world-famous among dedicated high-end fans. Our sales representatives will happily demonstrate to you the superiority of this amp. on your speakers, and also at home. Of course, the No.3 Millennium amplifier is also available with our high-end satisfaction guarantee. If you are interested in the technical data of this stereo amplifier as well as its sonic capabilities, you can request a data sheet as PDF file. The No.3 Millennium amplifier comes in a silver-colored "Aaron Silver" version, or with a black front flap in the version called "Night Shadow". Our current AARON price list is available for download as a PDF file. We wish you many hours of pleasure and music enjoyment with your new AARON amplifier. For more information, and also on the subject of our “High-End Financing Service“, you can contact us at any time. See you soon – in the circles of satisfied AARON owners.